FILE - King Abdullah of Saudi Arabia, right, welcomes Syrian President Bashar Assad upon his arrival to attend the Arab Summit, in the Saudi capital Riyadh, March 11, 2009. He has survived eight years of war and billions of dollars in money and weapons aimed at toppling him. Now Syrian President Bashar Assad is poised to be readmitted to the fold of Arab nations, a feat once deemed unthinkable as he forcefully crushed the uprising against his family's rule. And as President Donald Trump plans to pull out America's 2,000 soldiers from northeastern Syria, government troops are primed to retake the area they abandoned in 2012 at the height of the war. This would be a significant step toward restoring Assad's control over all of Syria, leaving only the northwest in the hands of rebels, most of them jihadis. It can seem like a mind-boggling reversal for a leader whose military once seemed dangerously close to collapse. But Russia's military intervention, which began in 2015, steadily reversed Assad's losses, allowing his troops, aided by Iranian-backed fighters, to recapture cities like Homs and Aleppo, key to his rule. “Rehabilitation by Arab states is inevitable,” said Faysal Itani, a resident senior fellow with the Atlantic Council's Rafik Hariri Center for the Middle East. FILE - Jordanian cars prepare to cross into Syria, at the Jordanian-Syrian border Jaber crossing point, in Mafraq, Jordan, Oct. 15, 2018. A key motive for Sunni Muslim Gulf countries is to blunt the involvement of their Shi’ite-led foe, Iran, which saw its influence expand rapidly in the chaos of Syria's war. But Syria's isolation was never complete. China, Russia, Brazil, India and South Africa maintained diplomatic ties. In the Arab world, Lebanon, Iraq and Algeria never broke ranks with Syria. Propped up by Russia, China and Iran, Assad never really felt the pinch politically. 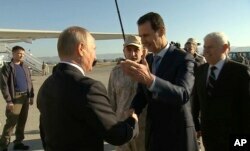 FILE - In a frame grab made available by Russian Presidential TV, Syrian President Bashar Assad, right, greets Russian President Vladimir Putin upon his arrival to the Hemeimeem air base in Syria, Dec. 11, 2017. A Saudi attempt to patch up relations with Assad would be a public acknowledgement of the kingdom's failure to oust him. At the same time, the involvement of Gulf Arab governments and private companies is crucial for any serious reconstruction effort in Syria. Reconstruction costs are estimated between $200 and $350 billion. The debate now appears to be about when, not whether, to re-admit Syria to the Arab League. At a meeting in Cairo on Wednesday, Egyptian Foreign Minister Sameh Shukri said Syria's return to the League is connected to developments on the political track to end the crisis. Iraqi Foreign Minister Mohamed Alhakim, speaking in Baghdad at a joint press conference with his Iranian counterpart, said Sunday that his country supports efforts to restore Syria's membership in the Arab League. 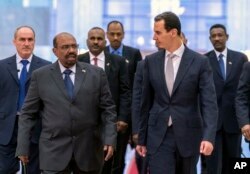 FILE - In this photo released by the Syrian official news agency SANA, Dec. 16, 2018, Syrian President Bashar Assad, right, meets with Sudan's President Omar Bashir in Damascus, Syria. Even Turkey, whose president in 2012 famously vowed to pray at Omayyad Mosque in Damascus after Assad's ouster, has signaled it would consider working with Assad again if he wins in free and fair elections. For Syrians who rose up against Assad's rule, it can seem like the country is right back where it started eight years ago, only with half a million dead and cities in ruins. “I don't imagine Assad's Syria becoming a fine upstanding member of the international community, but nor do I think it will languish in isolation,” Itani said.